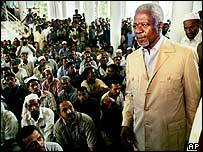 A Tamil rebel leader in Sri Lanka has warned that the government's travel restrictions on UN head Kofi Annan may have negative consequences for peace. SP Thamilselvan, head of the Tamil Tigers' political wing, condemned the restrictions on the secretary general's planned tour of rebel-held tsunami-hit areas. Mr Annan said he hoped to return "some day" to visit the rebel-controlled areas of the island. Sri Lanka by the tsunami two weeks ago. "I'm hoping to come back and be able to visit all areas of the country, not only those repaired, but also to celebrate peace," Mr Annan said at the end of his trip, which lasted less than 48 hours. "It's a difficult situation but I think if the whole nation comes together and works on the relief stage as well as reconstruction, it will instil enough confidence in each other to work on a peace process." Peace talks stalled in April 2003, but a ceasefire agreed in February 2002 remains in force, despite isolated incidents of killings blamed on both sides. In December the rebels threatened to return to war, which raged for two decades, unless the government resumed talks based on their demand for self-rule. Mr Annan has been touring the areas worst-hit by the Asian tsunami that struck on 26 December. He has now headed to the Maldives. More than 150,000 people have been killed across the Indian Ocean region. The UN now says it is optimistic that none of the survivors will lose their lives to hunger, as a result of a massive aid operation. Jim Morris, head of the UN's World Food Programme (WFP), told the BBC that aid had reached "nearly everyone... who has been harmed by the disaster". On Friday, the Tigers said Mr Annan had accepted an invitation to visit their leader, Velupillai Prabhakaran, during his visit to Sri Lanka. But Mr Annan indicated that the government had prevented him from doing so. "I am here on a humanitarian mission. I would like to visit all the areas, but as you know I am here as a guest of the government and they set the itinerary," Mr Annan told the Reuters news agency. Mr Thamilselvan, in effect the Tigers' deputy leader, told the BBC it was shocking that the government would prevail upon Mr Annan not to visit rebel areas, against his wishes. "This is a clear indicator of the discriminatory pattern that the government of Sri Lanka adopts when it comes to the problems of the Tamil people," he said. 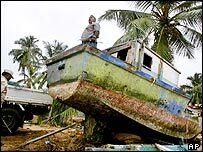 Earlier, a Tamil commander told the BBC that the devastation caused by the tsunami in northern Sri Lanka was far worse than from 20 years of civil war. The Tigers have complained that little aid has been sent to north-eastern areas of the country they control. President Chandrika Kumaratunga has disputed that, saying that the government has sent more aid to rebel-controlled areas than to the Sinhala-dominated south of the island.